Those blueberries in your fridge are not just for eating. They can also be used in homemade beauty products like this Blueberry Sugar Scrub I’m sharing today. Blueberries are full of antioxidants and vitamins. Did you know that they have more antioxidants than green tea? These tiny powerhouses work wonders for your skin making it brighter and more youthful looking. 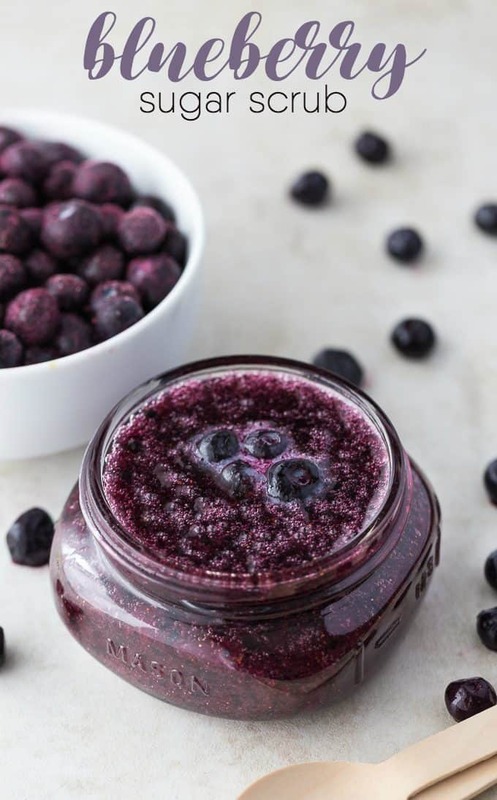 This DIY sugar scrub is made with frozen blueberries which are available year round. Fresh can be substituted if you like. Save this idea as one of the ways to use up your summer blueberry pickins’. Puree blueberries with a food processor or hand blender. Stir in sugar and coconut oil and spoon into a mason jar. Store in the fridge up to one month. I used natural sugar because it has a grittier texture. If you don’t have any, substitute regular white sugar. It’s only three ingredients (natural sugar, coconut oil and blueberries) and they are all safe to eat. I know some people say that they won’t put anything on their skin that they can’t also eat. This recipe fits the bill. Use this scrub on your body (not face). I use it in the shower so it’s less messy. Store it in the fridge so it stays fresher longer. I wouldn’t keep it any longer than one month though. I have a ton of other DIY beauty products coming up over the next couple months. They are so easy and fun to make. Keep an eye on my Beauty section for them. Have you ever used blueberries on your skin? What an interesting recipe for a scrub, it’s brilliant! I just happen to have everything ‘on hand’ — I’ll jump right on to it.. Blueberries are the best ! I love Body scrubs and this one looks so pretty and I want to make it! I bet it smells incredible! I’ve never used blueberries on my skin but this looks great and easy to make. Have never tried making a scrub myself. Must add it to my list! Yours looks so good! It looks so pretty! I imagine it would make my feet feel really soft and smooth too – great craft idea to make this with my daughter! I bet it smells good too! Blueberries are so good for you to eat so I am sure they are great in the scrub! I have never thought of using blueberries on my skin. I am going to try it! it looks too pretty to use. This sounds so easy and just so happens I have a bunch of Blueberries that I just froze! I have never used blueberries on my skin, but I am going to now!! I can’t imagine not eating the blueberries. They are right up there as a top food. But this does sound like a great idea. Thank you for the recipe. Awesome idea! So the blueberries don’t stain your skin? This body scrub sounds wonderful! I love the idea of a scrub with blueberries…my favorite fruit! wow that’s real easy and it would smell wonderful! I always have blueberries in my freezer for smoothies. Now I’ll be using some of them for this. This looks so good! I bet it would be hard not to eat. How convenient – I have quite a load of fresh blueberries to try this with 🙂 Thanks for sharing this Stacie, love it! That is the yummiest looking scrub! I can’t wait to try this – thanks! I haven’t done this before, blueberries for me have been muffins. 🙂 Looks amazing! Thanks for sharing at Merry Monday! It sounds lovely and i would love to try making it but do it not stain your skin?